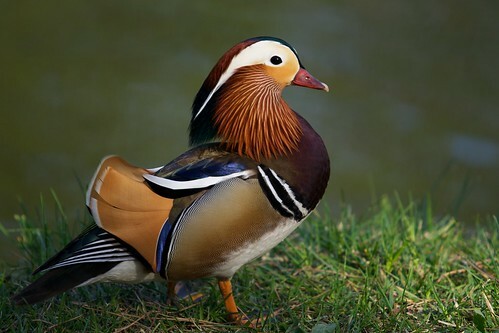 Profile: Mandarin Duck, originally uploaded by jasohill. Mandarin Ducks, which are referred to by the Chinese as Yuan-yang (simplified Chinese: 鸳鸯; traditional Chinese: 鴛鴦; pinyin: yuān yāng), are frequently featured in Oriental art and are regarded as a symbol of conjugal affection and fidelity. A Chinese proverb for loving couples uses the Mandarin Duck as a metaphor: "Two mandarin ducks playing in water" (simplified Chinese: 鸳鸯戏水; traditional Chinese: 鴛鴦戲水; pinyin: yuān yāng xì shuǐ). The Mandarin Duck symbol is also used in Chinese weddings, because in traditional Chinese lore they symbolize wedded bliss and fidelity. Specimens frequently escape from collections, and in the 20th century a feral population numbering about 1,000 pairs was established inGreat Britain. Although this is of great conservational significance, the birds are not protected in the UK since the species is not native there. Oh, thank you for feature my duck photos...:) I'm glad you like them. "I Couldn't Weasel My Way Out of Your Lens."